Amazon today entered the streaming music foray with the launch of its own bundled music service. Amazon Prime subscribers get free access to on demand streaming from a catalogue of 1 million tracks, the majority of which are older catalogue titles rather than frontline hits. Amazon’s move has received considerably less interest and hype than Apple’s acquisition of Beats but is in many respects every bit as important. The future of digital content is going to be defined by the content and device strategies of three companies: Apple, Amazon and Google. Each has a very different approach resulting in an equally diverse set of products and audiences (see figure). 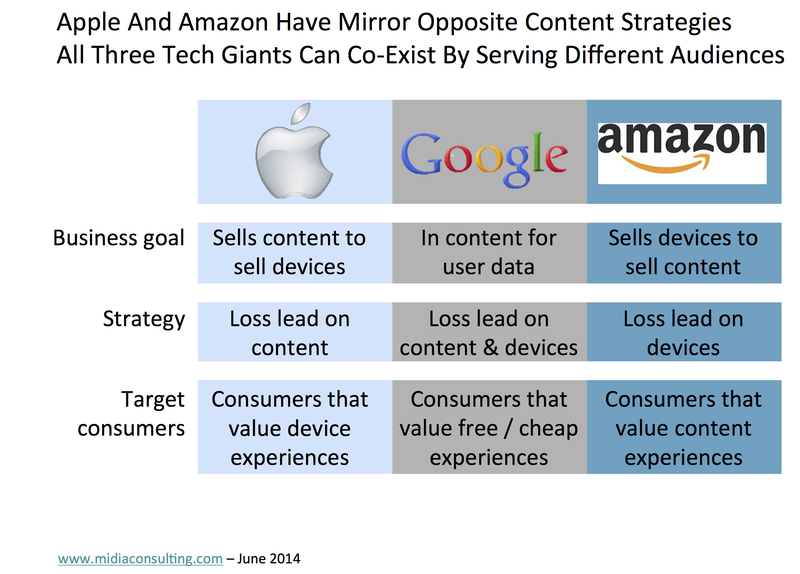 Amazon and Apple have mirror opposite content strategies: Apple loss leads on content to sell devices whereas Amazon loss leads on devices to sell content. (Google loss leads on both because its end goal is your data). 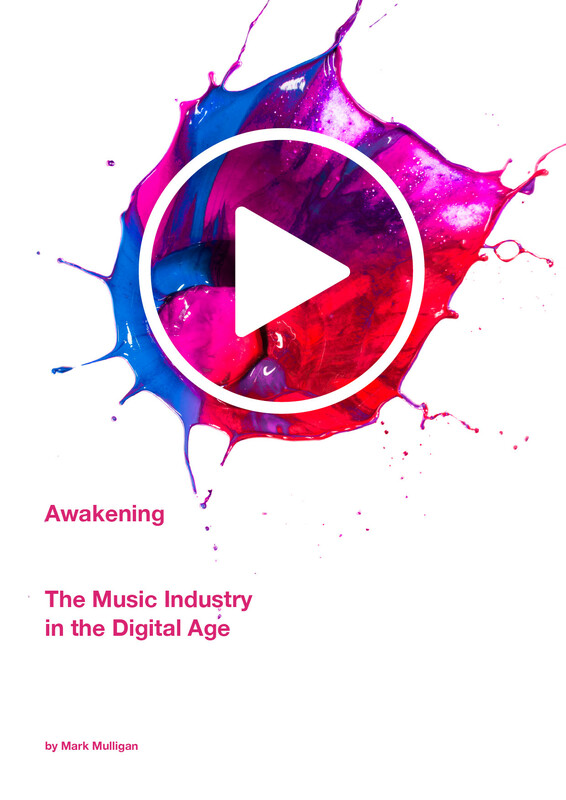 All three have a strong focus on music but all three understand clearly that the future of digital content lies in having multiple genre stores that traverse music, games, apps, video, books etc. All three also recognize the importance of hardware for delivering the crucial context for the content experience. Similarly, all three have a Content Connector strategy aimed at opening up the mass-market digital content opportunity in the home via the TV. Amazon’s inclusion of music streaming in its Prime offering speaks volumes about the perceived importance of music as a product to the retailer. Music used to be the crucial first rung on the ladder for Amazon customers. Buyers would start off with a low consideration purchase item like a CD or DVD and the next thing they knew they were buying microwaves and computers. Music is still plays an important role in Amazon’s customer life cycle, but it is no longer a product needs paying for with a separate payment. Music has become the ‘feels like free’ soundtrack to a video subscription with the added benefit of free shipping for online shopping. Out of those three core value pillars of Amazon Prime, music streaming is probably the smaller. Music has become the National Geographic channel in the cable subscription: a nice part of the overall proposition but not something that carries inherent monetary value on its own. 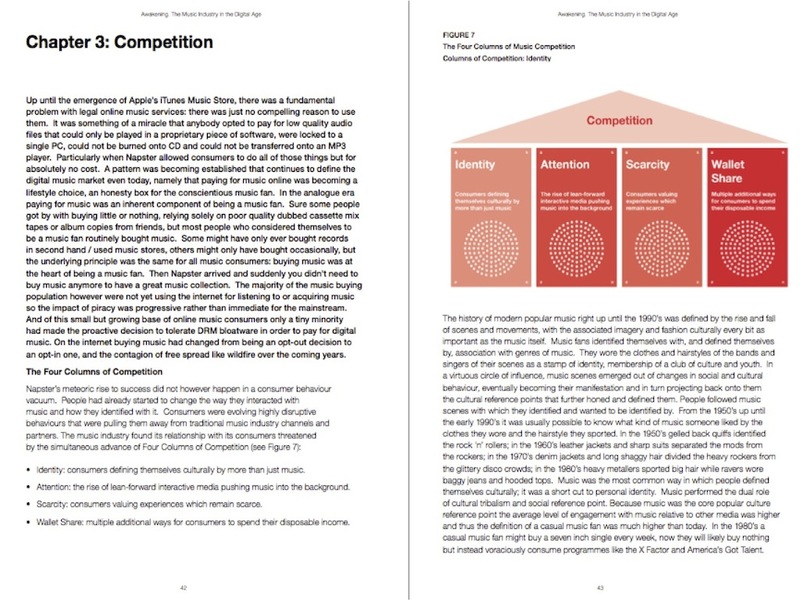 The harsh reality is that this is probably a sound strategy for engaging the mainstream consumer with music streaming (the extensive selection of curated playlists on top of a modest 1 million track catalogue hints at the mass market positioning). But whether this is the best strategy for the mainstream is another thing entirely. Labels fear that free services like Spotify free and Pandora threaten to erode consumers’ perceptions of music as a paid for commodity. But at least in those environments they are actively adopting a music service in its own right. With Amazon Prime there is a real risk that music is being relegated to the role of muzak in the elevator. Velvet handcuffs: Music downloads are monetized CRM for Apple, a means of enhancing the device experience. Purchased tracks and an iTunes managed library act as velvet handcuffs for Apple device owners. But for those consumers that use a streaming subscription app, the playlists and music collection can exist on any device. Suddenly the handcuffs slip off. This is why Apple has to get streaming right in short order. It simply cannot afford to lose swathes of its most valuable device customers at the next handset replacement cycle. Chinks in the iTunes armour: Until the launch of the App Store, 3rd party music services had no way of breaking into the iTunes ecosystem and were, in the main, doomed to the role of also rans. The App Store was the chink in the otherwise impregnable iTunes armour that allowed those 3rd parties to not just launch punitive raids but to set up camp in Apple’s heartlands. It was the price Apple had to pay to enter the next phase of its business, but now it is ready to shore up its defences once more. 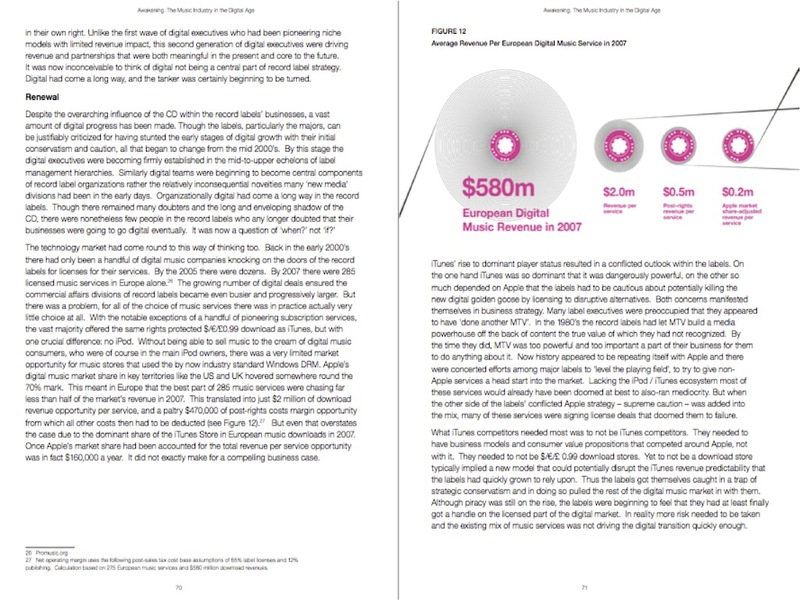 Eating from Apple’s table: The vast majority of streaming music subscribers were already digital download buyers first, and of those the majority were either current or past iTunes Store customers when they became subscribers. On a global scale, subscriptions have first and foremost been about transitioning existing spending rather than creating new digital customers. The picture is very different in Nordics, the Netherlands and South Korea but those markets contribute far less to global scale than the markets (US, UK, Australia etc.) where this trend dominates. Apple has provided the core addressable market for streaming services for the last five years. Now those companies worry over where will they be able to get new subscribers if Apple start taking subscriptions seriously. Apple will not have to play fair: Although Apple knows it is under the watchful eye of various regulatory authorities following the eBook price fixing episode, there is still plenty it can do to make life hard for 3rd party streaming services. Just take a look at what Amazon is reportedly getting away with in its book pricing dispute with Hachette: delaying shipments of the publisher’s books to customers, removing buy buttons from pre-ordered books, even pointing Amazon customers to competitive titles when searching for Hachette books. Fair play or foul, the power of the retailer is huge. Whether Apple simply ensures Spotify et al don’t appear in search results, or that they are never quite able to integrate seamlessly with iOS anymore for no specific reason that anyone can quite put their finger on….But even without resorting to such behavior, simply by deeply integrating an Apple (or Beats) branded subscription service natively into its devices and ecosystem, Apple will have the upper hand and 3rd parties will find it a whole lot harder to fish in Apple’s waters. None of this is necessarily bad for the market either. In fact it could be just what the subscriptions business needs. To finally focus on green field opportunity beyond the confines of the Apple elite. Nor should Apple even limit its subscription focus to streaming or to music. The rise of the Content Connectors points to Apple, Amazon and Google pursuing digital content strategies in the round, that do not get bogged down with super serving any individual content type at the expense of the rest. Apple’s best mid-term subscription play may yet simply prove to be a monthly allowance of iTunes credit across all content types, bundled into the cost of the device. Put that on top of iCloud, iTunes Radio, Beats Music and suddenly you have a very compelling multi-content offering. Something far out of the reaches of the current product roadmaps of any of the stand alone music services. Can Apple afford to loss lead with music subscriptions to pursue such a strategy? Well, remember Apple’s entire digital music business has been built on loss leading. Whatever the final outcome, the mutual fear factor balance looks set to tip in Apple’s favour for a while. 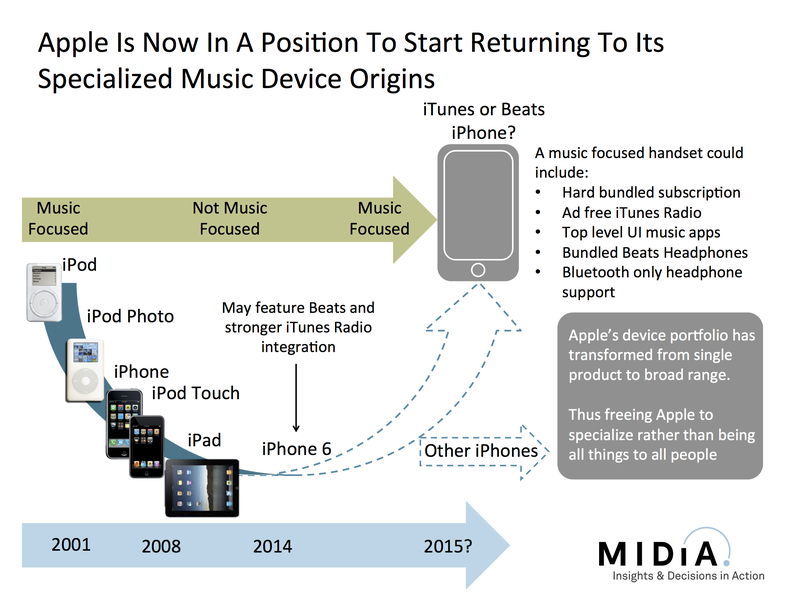 Segmenting music consumers: When Apple’s portable device business portfolio consisted of iPods alone it was immediately obvious who the music fans were within its customer base. Now it is far more difficult for Apple to identify the media preferences of potential customers until they have actually started using an Apple device. That is one of the retailing implications of producing multi-purpose devices. But start selling device-headphone bundles, or even device-headphone-music service bundles and Apple will find itself with a highly effective tool for targeting the music aficionados. These super fans can be sold premium music products without the risk of alienating other customers with premium price points in the main product portfolio. Reinvigorating the brand: Apple is not a high-end brand and never has been. Instead Apple plays in the same brand space Sony did in the 1980s and 1990s, namely that of the aspirational premium mainstream: the top end of the mass market and just scraping the lower reaches of the upper echelons. But the price Apple has paid for large-scale success is that its user base and brand have crept downwards. No product can take more blame than the iPhone: the smartphone market is the most commoditized of sectors, with fixed replacement cycles, carrier subsidies, fierce competition, aggressive marketing all reducing brand loyalty and value. Beats, for all the criticism of the technical quality of its headphones, has created an aspirational, youth focused brand built on the foundations of the aesthetics of quality. Like Apple, Beats is a brand focused on the upper end of the mainstream and would be a great strategic complement, presenting the opportunity for Apple to reinvigorate its core brand values and at the same time enhance youth resonance. Putting cash to work: Apple is a very cash generative business with an investor community that has consistently higher expectations than Apple is able to deliver on. Consequently Apple has had to face the paradoxical situation of delivering results of unprecedented quality only to see tepid investor response. Couple that with ever growing demands to redistribute its vast cash reserves to investors in the form of dividends and it is little wonder that Apple has been on something of a spending spree of late. Spending big on Beats kills two birds with one stone: it puts cash to work and sends a strong message to investors. Whatever happens to the prospective deal, what it clear is that there are countless potential benefits to Apple. And if the deal does not transpire then it is equally clear that Apple either needs another such partner quick, or instead needs to put its cash to work right away on addressing each and every of these strategic permutations.